The hotter temperatures that the world is now experiencing (see Is global warming really happening?) have a significant impact on weather generally. Weather patterns are changing, some places are getting more rain, some less, and extreme weather events are becoming more severe and more frequent. 90% of major disasters are weather related. Weather patterns are changing. For example, some places will experience more rain than they used to, others less, and the annual weather patterns won’t always remain the same. We are likely to experience more extreme weather. The (Intergovernmental Panel on Climate Change warns of more severe storms, floods, droughts, heatwaves and cyclones. Ocean levels have risen globally by about 10 cm in the past 50 years. This is increasing the impacts of storm waves and coastal erosion. The area covered by Arctic sea ice is declining in extent by 10-15 per cent per decade, and its average thickness has decreased by 40 per cent over the last half century, and the rate of loss more than doubled in the last decade. The lowest ever areal coverage was in 2012, and experts expect 2016 to be similarly bad. The extent of the Arctic ice has impacts on other aspects of climate. Glaciers are retreating all over the world. Snow depth and coverage is declining globally. Rainfall will become more variable and extreme – less rain in some locations but more in others, longer droughts, larger storm runoff over shorter periods of time and fewer years of “normal” rainfall and river flows. For example the Australian Bureau of Meteorology has shown that the western half of the arid Australian inland is now receiving significantly more rain than they did 50 years ago. Meanwhile, the productive farmland and major cities of the southeast are now receiving significantly less rainfall than 50 years ago, though slightly more than a century ago. The experts say that Australia is now experiencing a noticeably different climate than previously, and farming must take account of this. Droughts are becoming more severe. The last decade or so has seen significant drought problems in North Africa, Brazil, India, Syria, China, Australia and Spain, with projections that this will only become more severe globally. Rainstorms and cyclones are already becoming either more frequent or more destructive and are predicted to become more so in the future, due to climate change. In the period 1995 to 2015, flood disasters killed 157,000 people and affected 2.3 billion. 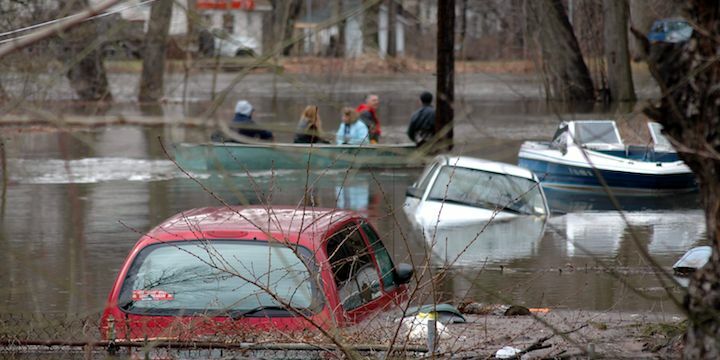 The annual rates of death and affect from flooding are on the rise, due at least in part ot global warning. The trends of the past two decades have continued, in one place or another, in the last two years. Severe drought continued to be a problem in recent years – in Brazil, USA (California), North Korea, South Africa, Central America, South Africa, Ethiopia and the tiny Pacific Island of Palau. In most of these places, lives and livelihoods are at risk. Meanwhile, flooding has also been severe in the Middle East (Oman, Saudi Arabia and Yemen), South America (Uruguay, Argentine, Brazil, Paraguay), USA (Texas), Africa (Malawi, Kenya, Angola), the Pacific region (Fiji), Europe (Spain, UK) and Asia (Pakistan, Afghanistan). Many people have died in these floods, and many more have been displaced. Climate change was identified as a major contributing cause to the devastating Cyclone Pam, which left a trail of destruction across Vanuatu. Australia’s Climate Council has warned that many Pacific Island states are particularly vulnerable to climate change leading to sea level rise, coastal inundation, ocean acidification . In the small Caribbean island of Dominica, an intense tropical storm caused significant damage equivalent to 90% of the country’s GDP. It is reported that island states are coming under greater pressure from extreme weather caused by global warming. Destructive storms in eastern Australia were a sign of things to come – “a clear trend in repeat disasters”. The scientists are convinced, because the data is there. But increasingly economists are identifying costs of climate change, and insurers and financiers are responding. UK insurer Lloyd’s has accepted the reality of increased catastrophic damage because of climate change. It has estimated that hurricanes and storms are more severe because of rising water temperatures and sea levels. For example, the 20 cm rise in water levels near Manhattan Island increased the surge losses in New York city caused by Superstorm Sandy by 30%. Almost twenty years ago, this Australian insurance company believed that human-induced climate change was a reality to be addressed with appropriate urgency , and was re-assessing weather-related risk as a consequence. It said the costs of natural disasters in Australia and worldwide were increasing rapidly. Time magazine reports that economic studies predict that on present trends, global average incomes will be reduced by 23% by 2100 because of temperature rises. Citigroup estimates that reducing global temperature rise significantly could save$50 trillion of global GDP. Three years ago a study estimated that climate change was already contributing to the deaths of nearly 400,000 people a year and costing the world more than $1.2 trillion, wiping 1.6% annually from global GDP. The frequency and severity of extreme weather are increasing, fueled by global warming.